Are you always in a rush to get your hair done into a half-decent state before rushing out the door every morning but bored of the usual hairstyles? Why not have a look through some of these ideas on how to spice up a classic ponytail by adding that little something extra to your usual hairstyle. High, low, side... whichever you choose there should be at least one way to make it little more interesting from the list below. Wrap some of your hair from your ponytail around your hair-tie to give a more sleek look. 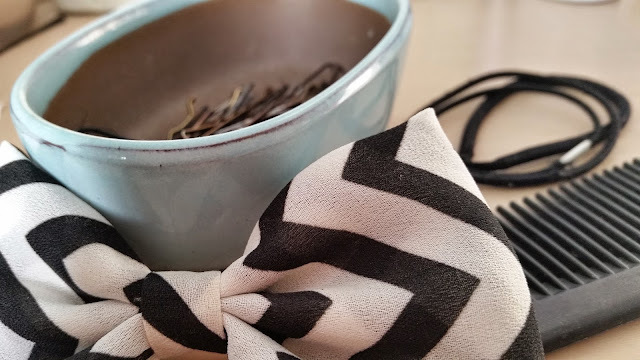 Replace your boring black hair-tie for a cute ribbon. Why not braid you hair the night before (some more ideas to curl or wave your hair naturally overnight can be found here) to give your ponytail that slightly different feel. You don't have to tie all your hair up! Why not just try tying half of it up and leaving the bottom layer hanging loose in a half updo. You can tie the top layer up high with a hair elastic or low with some bobby pins, it really just depends on what look your going for. Add a French braid on one side (or both) as an accent to give it that something extra. Instead of doing a French braid, slightly alter the idea above by doing a Dutch braid, I feel like this gives a more messy look compared to a French braid. I also think a Dutch braid would look really good as an accent to a ponytail if you have wavy or curly hair but it would look great on straight hair too! Twist a piece of hair from each side or just one and bring it back into your ponytail. You can choose to have a thin or thick twist. Do whatever you feel like! Add a fishtail or braid to the bottom part of your ponytail. After tying your hair up into a ponytail, just braid the bottom and use a hair-tie to secure it. Add cute thin little braids in your ponytail to give it that slightly more fun look. Add some more volume to your hair before tying it up into a ponytail. What's your usual hairstyle? Let me know in the comments down below!